Before I started my career as a fashion blogger and on-air style expert, I really had no idea I could actually make this my job. Since working as a blogger, I've come across so many amazing women, who hold even more amazing jobs in the fashion industry. From fashion designers, creative directors, stylists, fashion editors, there are so many opportunities. I often come across young girls or perhaps women who are looking for a career change, who ask me how I got started or if I know of different career opportunities while still working in fashion. I thought I'd start a new series on the blog called "I Want Your Job," in which I'll interview women who work in the fashion industry and how they got their start. First up is Sarah Carson. Sarah is an investment banker turned fashion designer who launched her own clothing line, Leota, in 2010. Without any prior knowledge of the fashion industry, her clothing line has doubled in sales annually since its inception and currently sells to over 400 fine retailers nationwide. In addition to everyday-wear and dresses, she has expanded her collection to also include maternitywear. Q: Tell me about your clothing line, how did it get started? 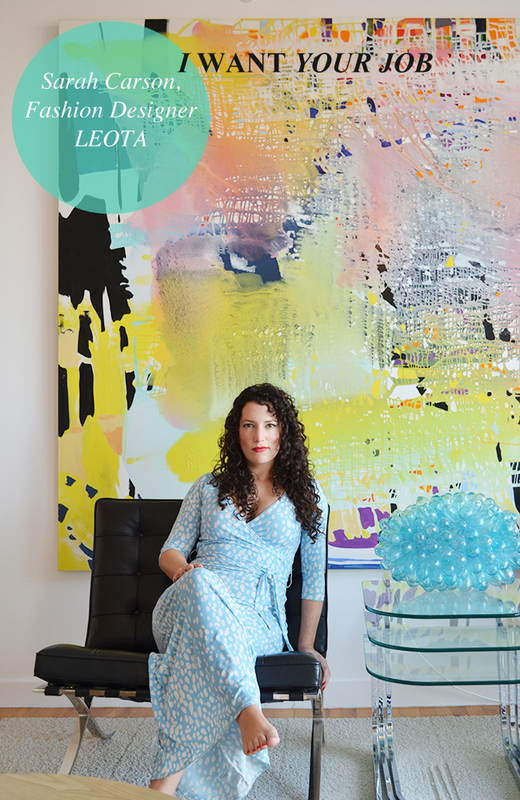 A: Leota is a contemporary fashion brand made in New York. We design our own prints and specialize in the perfect day-to-night dress that you can wear anywhere. Combining luxury wrinkle-free stretch fabrics with chic prints, Leota is the new uniform for sophistication and simplicity. In addition to our contemporary collection, we also have a maternity line and a party dress collection. I used to spend countless hours at my home sewing machine churning out cute jersey dresses I could wear anywhere. After countless compliments and special orders, I started to think I should be making dresses for a living. I named the business after my great grandmother Leota, because my family history is the inspiration for my brand and my personal style. My great grandmother Leota used to say, “good manners and effortless glamour never go out of style.” I launched Leota with 5 printed dresses back in 2010. I didn’t know a soul in the apparel business so I had to find creative ways of getting information. I would follow fabric delivery guys around the garment district to figure out where the factories were. You have to be scrappy to make it in fashion. When you are a new business, people don’t work with you because they have to – they work with you because they want to. That means people have to like you. I focused on building long-term relationships. Q: What are the first steps in starting a clothing line? A: First, be financially conservative and focus on sales. Before you start paying for a fancy runway show and ads in Vogue, prove that your concept works by selling your product to stores. Figure out how to perfect your fit, produce your collection, ship on time. Manufacture only the quantities you have pre-sold. Analyze the market. What is the unmet need in the marketplace that you can fill? Who are your competitors and where will your product “hang”? What is your price point? Who do you imagine wearing your clothes and where are they wearing it? Your styling, pricing, and end consumer need to make sense. One myth is that retailers want newness. The truth is that buyers are very risk-averse and are under pressure to be profitable. Therefore, they are hesitant to try out a new brand. Why would they buy your line when they already know their existing brands will sell? That is the reality. If a store buys your line for a season, there is no guarantee they will buy it the next season. The selling process never stops. You can never get comfortable. Q: How does one go about finding a manufacturer. Are there any sources/websites you can recommend? Do you recommend looking for U.S. manufacturers? A: Local, ethical manufacturing is central to my values and my brand. Leota is 100% made in NYC by local artisans and we are proud to be creating jobs and contributing to the economy right here. Thanks to the investment partnerships between the NYC Economic Development Council, the Fashion Institute of Technology, and brands like Leota, mass production in New York is easier than ever. Leota produces thousands of garments locally every month at a profitable margin and I encourage new brands to do the same. A. First, invest in a trade show booth since that is where the stores go to shop. There are dozens of shows, so make sure you are in the right one for your brand by attending all of them a season in advance. I also recommend hiring a seasoned sales representative to sell your line for you. My approach to business is to hire for my weaknesses. I don’t hire people that will make me feel good about myself and tell me how amazing I am. I hire people who bring something different to the table and who will challenge me. A good sales rep brings a rolodex of buyer relationships that can get you fast exposure to your target market and give you valuable advice on how to tweak your designs so they will sell better. Q: Does one need to have a lot of money to start their own clothing line? A. If you have little money, can dedicate 100% of your time and energy, and can commit to never making the same mistake twice, then you have what it takes to start a clothing line. I got started with a stack of business cards, 5 sample dresses, and a trade show booth, and by the end of my first year I was selling my product to 50 stores. So many brands start out as the “it” thing for 5 minutes then the fizzle. I want to build a lifestyle brand for the long-term, and that doesn’t happen overnight. Leota is built on solid financial strategy and a practice of growing steadily and over time. Q: How did you break into the apparel industry? A: I had no experience in fashion – I have never even worked in a store! But I already knew how to break in to something new without a guidebook. In my teens, I convinced my mom to sign me up for karate class even though I was the type of kid who was afraid of the ball in gym class, and I worked my way up to become a 2-time national kung-fu champion and World Tournament competitor. In my 20’s I taught myself accounting and got hired as a Wall Street investment banker even though I had a degree in Gender Studies. So by the time I was ready for a career change after 8 years in finance, I knew that if I worked hard enough and was smart and passionate, anything was possible. I really believe that because I have seen so many people more talented than me fall by the wayside. Q: Any other helpful tips you can recommend? A: I believe the most successful people reach out and help others. Support other designers and bring a spirit of helpfulness to our industry. There is plenty of business to go around. Pay it forward! Thank you so much Sarah for all of your amazing tips! You can check out her collection at www.Leota.com. Hope you like our new series. Leave us a comment below and let us know what you think. Or if there's a particular field in fashion you'd like us to feature next, shoot us an email at info@vivafashionblog.com. Who is the artist who painted the canvas? What a great interview. Love this series!